You can change the size of the type on this page by using the "Font size . . ." option in the white bar at the top of the page. 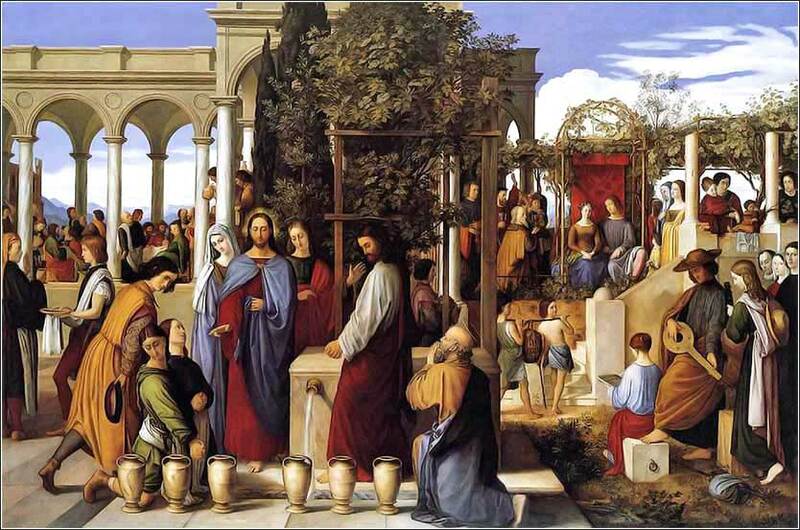 Wedding Feast at Cana by Julius von Carolsfeld ca. 1840. 294 people in our community are currently praying with you. Rachmaninoff’s Vespers are so majestic and profound, they can reach right into your heart and transform you. This is the sixth hymn, the Slavonic equivalent to Ave Maria. yako Spasa rodila yesi dush nashih. Lyrics from a traditional Orthodox prayer. I thank you, Master and Lover of mankind, King of the ages and giver of all good things, for destroying the dividing wall of enmity and granting peace to those who seek your mercy. I appeal to you to awaken the longing for a peaceful life in all those who are filled with hatred for their neighbors, thinking especially of those at war or preparing for war. Grant peace to your servants. Implant in them the fear of you and confirm in them love one for another. Extinguish every dispute and banish all temptations to disagreement. For you are our peace and to you we ascribe glory: to the Father and to the Son and to the Holy Spirit, now and forever and unto ages of ages. I pray, Lord our God, for all those who suffer from acts of war. I pray for your peace and your mercy in the midst of the great suffering that people are now inflicting on each other. Accept the prayers of your Church, so that by your goodness peace may return to all peoples. Hear us and have mercy on us. God of love, Father of all, the darkness that covered the earth has given way to the bright dawn of your Word made flesh. Make me and all who confess your holy name people of this light. Make me faithful to your Word that I may bring your life to the waiting world. Grant this through Christ our Lord. On the third day a wedding took place at Cana in Galilee. Jesus' mother was there, and Jesus and his disciples had also been invited to the wedding. When the wine was gone, Jesus' mother said to him, "They have no more wine." "Dear woman, why do you involve me?" Jesus replied, "My time has not yet come." His mother said to the servants, "Do whatever he tells you." Nearby stood six stone water jars, the kind used by the Jews for ceremonial washing, each holding from twenty to thirty gallons. Jesus said to the servants, "Fill the jars with water"; so they filled them to the brim. Then he told them, "Now draw some out and take it to the master of the banquet." This, the first of his miraculous signs, Jesus performed in Cana of Galilee. He thus revealed his glory, and his disciples put their faith in him. It's a bit hard to follow the dramatic narrative here; John, always concerned more with the theological message than the story, leaves out a lot of detail. When Mary tells Jesus that they are out of wine, his response — "Why involve me? My hour is not yet come." — is hard to follow. And Mary's next response, telling the servants to do whatever Jesus tells them, does not fit with his dismissive response. The metaphor, on the other hand, is transparent. Turning water into wine parallels the act by which Christ will transform into the resurrected Christ, who redeems us by shedding his blood. Now, his body is as ordinary and everyday as water; but in the time to come, it will change into something rare and valuable. So, Christ’s remark to Mary, that His time has not yet come, treats his mother's words as if they are a request for him to perform the great miracle, transforming himself and mankind from earthly beings, the descendents of Adam and Eve, into something greater and more precious: souls forgiven for their earthly sins, who may dwell with God after their body dies. The conversation between the banquet master and the bridegroom also lacks much in the way of storytelling — the point here isn't that Jesus had skills as a winemaker. The lesser or cheaper wine would seem to represent the prophets who preceded Christ. God has saved the best for last; Christ is the great wine, and he was given to us as the culmination of a long line of prophets. In case you have not studied John, this is called the “first sign” because John structures his Gospel around seven miracles of Christ, depicted as intentional signs of His divinity. 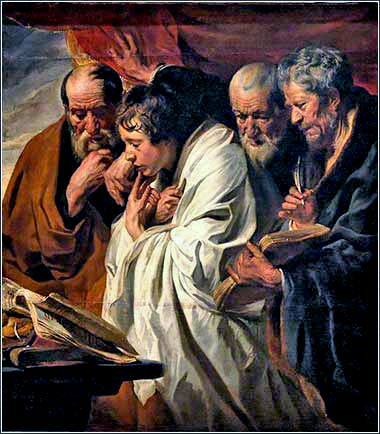 Four Evangelists by Jacob Jordaens, ca. 1630.